I’ll take two jaguar and a mink, please. Or, maybe they’re just referring to his hair? Where on earth did you find that gem?!?! Is it from the 60’s or 70’s? Too funny! He’s a beaut, isn’t he? Found it on Google’s equivalent of StumbleUpon. Oh, my God. 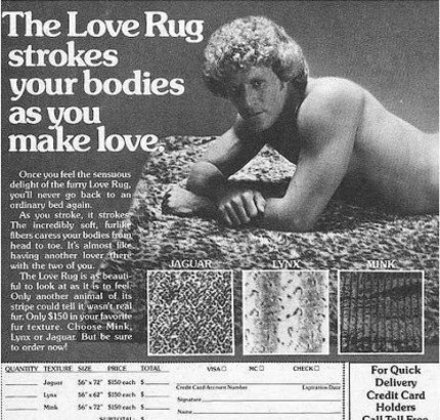 NOW I know what my dad meant when he said he was a “rug model in the 70’s”!! !